Kanha National Park has the honor of providing the setting for Rudyard Kipling’s classic novel, The Jungle Book. It’s rich in lush saal and bamboo forests, lakes, streams and open grasslands. The park is one of the largest national parks in India, with a core area of 940 square kilometers (584 square miles) and surrounding area of 1,005 square kilometers (625 square miles). Kanha is well regarded for its research and conservation programs, and many endangered species have been saved there. As well as tigers, the park abounds with barasingha (swamp deer) and an extensive variety of other animals and birds. Rather than offering one particular kind of animal, it provides an all-round nature experience. In the state of Madhya Pradesh, southeast of Jabalpur. The park has three entrances. The main gate, Khatia Gate, is 160 kilometers (100 miles) from Jabalpur via Mandla. Mukki is nearly 200 kilometers from Jablpur via Mandla-Mocha-Baihar. It's possible to drive through the park's buffer zone between Khatia and Mukki. The Sarhi Gate is nearly 8 kilometers from Bichhiya, on National Highway 12, about 150 kilometers from Jabalpur via Mandla. Khatia Gate leads into the park's buffer zone. Kisli Gate lies a few kilometers ahead of it, and leads into the Kanha and Kisli core zones. The park has four core zones -- Kanha, Kisli, Mukki, and Sarhi. Kahna is the oldest zone, and it was the park's premium zone until the concept was abolished in 2016. Mukki, at the opposite end of the park, was the second zone to be opened. In more recent years, the Sarhi and Kisli zones were added. The Kisli zone was carved out of the Kanha zone. While most of the tiger sightings used to take place in the Kanha zone, these days sightings are becoming more common all over the park. This is one of the reasons why the premium zone concept has been abolished. Kanha National Park also has the following buffer zones: Khatia, Motinala, Khapa, Sijhora, Samnapur, and Garhi. The nearest airports are in Jabalpur in Madhya Pradesh and Raipur in Chhattisgarh. Travel time to the park is about four hours from both, although Raipur is closer to the Mukki zone and Jabalpur is closer to the Kanha zone. The best times to visit are from November to December, and March and April when it starts getting hot and the animals come out in search of water. Try to avoid the peak months during December and January, as it's very busy. It can also get extremely cold during the winter, particularly in January. There are two safaris a day, starting from dawn until late morning, and mid afternoon until sunset. The best time to visit the park is early in the morning or after 4 p.m. to spot the animals. The park is closed from June 16 to September 30 each year, due to the monsoon season. It's also closed every Wednesday afternoon, and on Holi and Diwali. The fee structure for all national parks in Madhya Pradesh, including Kanha National Park, was substantially overhauled and simplified in 2016. The new fee structure became effective from October 1, when the parks reopened for the season. Under the new fee structure, foreigners and Indians pay the same rate for everything. The rate is also the same for each of the park's zones. It's no longer necessary to pay a higher fee to visit the Kanha zone, which used to be the park's premium zone. In addition, it's now possible to book single seats in jeeps for safaris. Safari permit fee -- 1,500 rupees for a whole jeep (seating up to six people), or 250 rupees for a single seat in a jeep. Children under five years of age are free. Guide fee -- 360 rupees per safari. Vehicle hire fee -- 2,200 rupees per jeep. Jeeps can be hired from the Madhya Pradesh Tourism Development Corporation at the Khatia entrance, or the Kanha Safari Lodge at the Mukki entrance. Safari permit bookings for all zones can be made online on the MP Forest Department website. Single seat bookings are only offered online for core zones though. Book early (up to 90 days in advance) because the number of safaris in each zone is restricted and they sell out fast! When booking online, you will only be charged the permit fee. This fee is valid for one zone, which is selected when making the booking. The guide fee and vehicle hire fee are to be paid separately at the park before undertaking the safari and will be distributed equally between the tourists in the vehicle. At the time of booking, you will see the number of seats remaining in each zone. You may also see that some options are displayed with a "W". This means that you'll be placed on a waiting list and will only get a confirmed permit if it clears. If this doesn't happen at least five days before the start of your safari, your booking will be automatically canceled and you'll be given a refund. Hotels who have their own naturalists and jeeps also organize and operate safaris into the park. Private vehicles aren't allowed into the park. The park's management has introduced a number of new tourism facilities. Night jungle patrols take place through the park from 7.30 p.m. until 10.30 p.m., and cost 1,750 rupees per person. Elephant bathing takes place in the park's Khapa buffer zone between 3 p.m. and 5.p.m. daily. The cost is 750 rupees entry fee, plus 250 rupees guide fee. There are nature trails in the buffer zones that can be explored on foot or bicycle. One of the most popular ones is the Bamhni Nature Trail near the park's Mukki zone. Both short walks (two to three hours) and long walks (four to five hours) are possible. Don’t miss experiencing in a sunset at Bamhni Dadar (a plateau that’s also known as sunset point). It provides a mesmerizing view of the park’s grazing animals as the sun disappears down the horizon. Elephant rides are no longer generally available to the public. It is possible to apply in advance to the forest department but approval isn't guaranteed and won't be provided until the day before. There's also a wide range of other accommodations, from budget to luxury, in the vicinity of Mukki and Khatia gates. Kipling Camp, near Khatia Gate, has its own pet elephant that guests can ethically interact with. Not far from Khatia Gate, boutique Courtyard House is delightfully private and serene. For a relaxing escape, Wild Chalet Resort has reasonably priced budget cottages by the Banjar River, a short drive from Khatia. The cottages at family-operated Pug Mark Resort are recommended as an inexpensive option, near Khatia Gate. If you want to splurge, you'll love Pugdundee Safaris Kanha Earth Lodge. Alternatively, mid-range Kanha Village Eco Resort is an award-winning responsible tourism project. Near Mukki, Kanha Jungle Lodge and Taj Safaris Banjaar Tola are pricey but worth it. If the thought of a secluded and rejuvenating and stay with organic farming interests you, try the very popular Chitvan Jungle Lodge. Also near Mukki, award-winning Singinawa Jungle Lodge showcases the region's tribal and arts culture, and has its own museum. Named Most Inspirational Eco Lodge of the Year in the 2016 TOFTigers Wildlife Tourism Awards, stunning Singinawa Jungle Lodge has its own Museum of Life and Art, dedicated to tribal Gond and Baiga artisans, on the property. The lodge is located on 110 acres of jungle bordering the Banjar River. While many lodges focus on safaris into the national park, Singinawa Jungle Lodge provides its guests with their own naturalist and offers many experiences that enable guests to immerse themselves in the wild. The accommodations at the lodge are secluded and spread out through the forest. They consist of 12 very spacious rustic stone and slate cottages with their own porches, a two-bedroom jungle bungalow (The Wildernest), and a four-bedroom jungle bungalow (The Perch) with its own kitchen and chef. Inside, they're individually decorated with a fusion of wildlife paintings, colorful tribal art and artifacts, antiques, and items handpicked by the owner. Massive soothing rain showers in the bathrooms, plates of delicious handmade tiger pugmark cookies, and Indian jungle tales to read before sleeping, are a highlight. The king size beds are super comfortable and the cottages even have fire places! Expect to pay 19,999 rupees per night for two people in a cottage with all meals, services of a resident naturalist, and nature walks included. The two-bedroom bungalow costs 33,999 per night, and the four bedroom bungalow costs 67,999 rupees per night. Rooms in the bungalows can be booked separately. See rate details here. 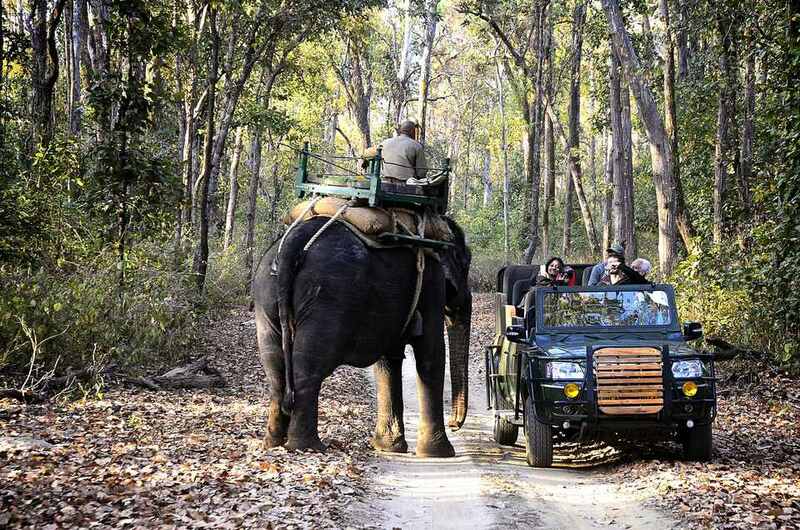 Safaris into the national park are extra and cost 6,000 rupees for a group of up to four. For the lodge's owner and managing director, Mrs. Tulika Kedia, establishing the Museum of Life and Art was a natural progression of her love for and interest in indigenous art forms. Having founded the world's first dedicated Gond art gallery, Must Art Gallery in Delhi, she has devoted significant time to acquiring artworks from different tribal communities over the years. The museum houses many of these important works, and documents the culture of the indigenous Baiga and Gond tribes, in a space that's accessible to tourists. Its collection includes paintings, sculptures, jewelry, everyday items, and books. The accompanying narratives explain the meanings of the tribal art, significance of tribal tattoos, origin of the tribes, and the intimate relationship that the tribes have with nature. In addition to exploring the museum, guests can connect with the local tribes and learn about their lifestyles first hand by visiting their villages. The Baiga tribe is one of the oldest in India and they live simply, in villages with mud huts and no electricity, untouched by modern development. They cook with primitive implements, cultivate and store their own rice, and brew potent toddy from the flowers of the mahua tree. At night, members of the tribe dress themselves in traditional attire and come to the lodge to perform their tribal dance around the fire for guests, as an additional source of income. Their transformation and dance is captivating. Gond tribal art lessons are available at the lodge. Attending the local weekly tribal market and cattle fair is also recommended. If you're keen to become further acquainted with the tribes, you can bring children from the tribal village that the lodge supports with you on safari into the national park. It's an exciting experience for them. Anyone who's feeling energetic can also go cycling into the interior of the reserved forest to a tribal Baiga village with beautifully painted mud huts and panoramic views. Singinawa Jungle Lodge undertakes conservation work through its dedicated foundation and you can join in the daily activities, visit a school that its adopted, or volunteer work on projects. Children will love their time at the lodge, with activities specially tailored to different age groups. Other experiences include day trips to Phen Wildlife Sanctuary and Tannaur river beach, meeting a community of tribal potters, visiting an organic farm, birding around the property (115 species of birds have been recorded), nature trails, and walks to learn about the forest restoration works on the property. When you're not having adventures, get a relaxing reflexology treatment at The Meadow spa overlooking the forest, or laze by The Wallow swimming pool spectacularly surrounded by nature. It's also worth spending time in the atmospheric lodge itself. Spread over two levels, it has two large outdoor terraces with lounge chairs and tables, a couple of dining rooms, and a indoor bar area. The chef serves up a delicious variety of Indian, pan Asian and Continental food, with Tandoori dishes being the specialty. He's even putting together a cookbook featuring local ingredients. Before you leave, don't miss stopping by the lodge's shop where you can pick up some souvenirs! Visit the Singinawa Jungle Lodge website or see photos on Facebook. What's Safari Cost at Kanha and Bandhavgarh National Parks?